Sometimes the difference between good and extraordinary lies in a whiff of wood smoke. Consider this salsa: You start with the usual ingredients—ripe summer tomatoes, sweet onions, jalapeños—plus one offbeat ingredient, raw corn. You smoke them before dicing and blending. Long enough to impart a hickory smoke flavor, but short enough to keep the crunch of raw fresh vegetables. Step 1: Holding each ear of corn upright, slice the kernels off the cob using broad strokes of a chef’s knife. Transfer the corn kernels to a mixing bowl and set aside. Step 2: Set up your grill for indirect grilling and preheat to medium. 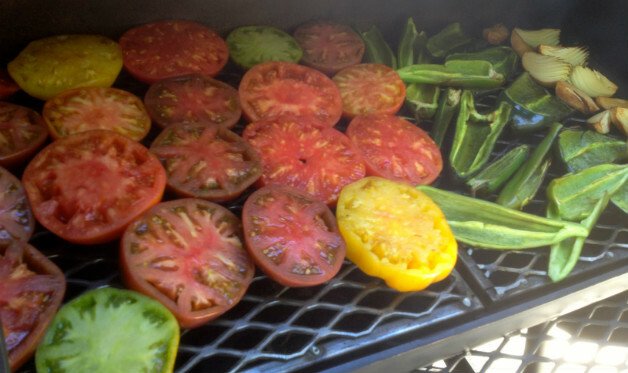 Arrange the tomatoes and jalapeños (cut sides up), onion, and garlic on the grill grate over the drip pan. Toss the wood chips on the coals. Cover the grill and smoke the vegetables for 10 minutes—long enough to impart a smoky flavor, but not so long that you cook them. Step 3: Let the veggies cool to room temperature. Finely dice the tomatoes, onion, jalapeño, and garlic by hand or in a food processor. Add to the corn and mix in the cilantro, lime juice, and salt to taste. The salsa should be highly seasoned. You’ll serve the salsa while everyone is gathered around watching you put the final touches on your pork shoulder. Can you use store-bought salsa? Most people do. That’s why you won’t. Enough said.